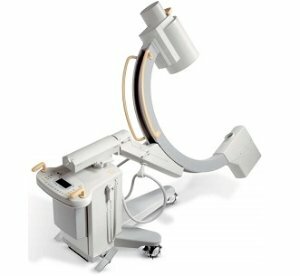 The Philips BV Libra has been claimed to have the best price/performance value in its segment. There may be some truth to that claim, considering that more than 20,000 units of this imaging device has been sold worldwide. It is easy to use and offers a host of capabilities for a c-arm of its size and cost. It is lightweight, easy to transport, compact, and easy to operate. The BV Libra sports what is called “humanware” design, with handles and contours shaped to be used by people. DoseWise is a Philips initiative to cut down the radiation dose required to produce great images. The BV Libra has single button control, and its interface has a minimum of functions and menus to make operation simple. It has advanced image processing capable of vascular subtraction and remasking; real-time contrast, brightness, and edge enhancement; automatic movement detection; and BodySmart software which recognizes anatomy. It is capable of parallel movement to virtually extend the field of view for spinal procedures. Safety is not an issue as the BV Libra’s real pulse fluoro mode cuts the necessary radiation doses in half. The unit also has unique beam filters that can reduce the amount of skin radiation exposure by 40%. The thousands of facilities and practices that have purchased this unit can’t be wrong. To join their ranks, contact Providian and inquire about a refurbished Philips BV Libra. I want a free price quote on the Philips BV Libra, send it today!